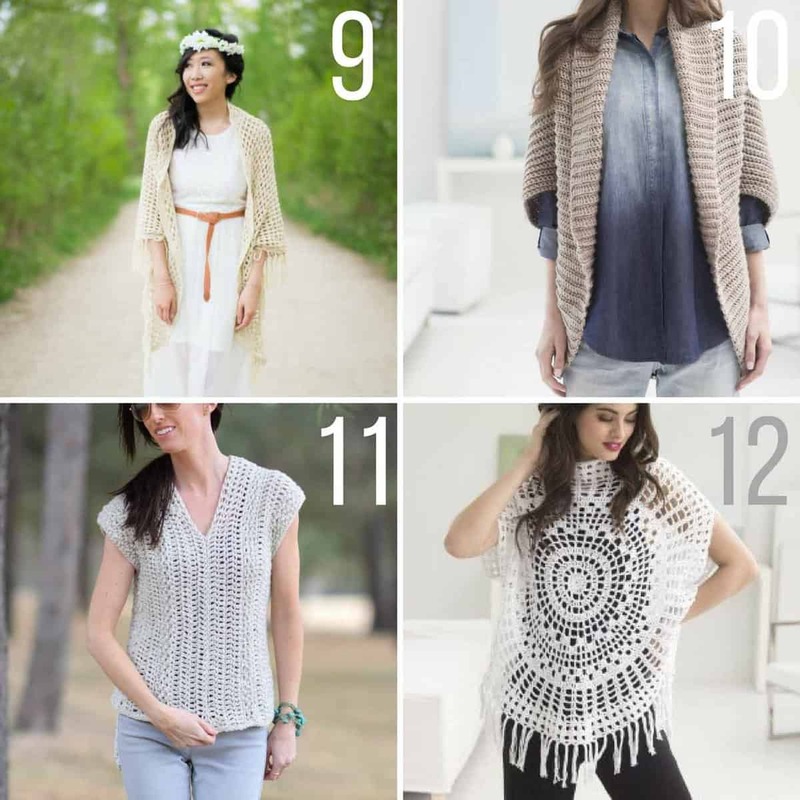 24+ Popular Spring and Summer Crochet Patterns -- All Free Patterns! 24+ Popular Spring and Summer Crochet Patterns – All Free! Warm weather doesn’t have to send your crochet hook into hibernation! This collection of popular spring and summer crochet patterns will give you plenty of ways to stay busy–and best of all, they’re all free! As the days get longer and the temperatures get warmer it’s easy to think your yarn hobbies have to take a backseat to baseball games and sipping margaritas. 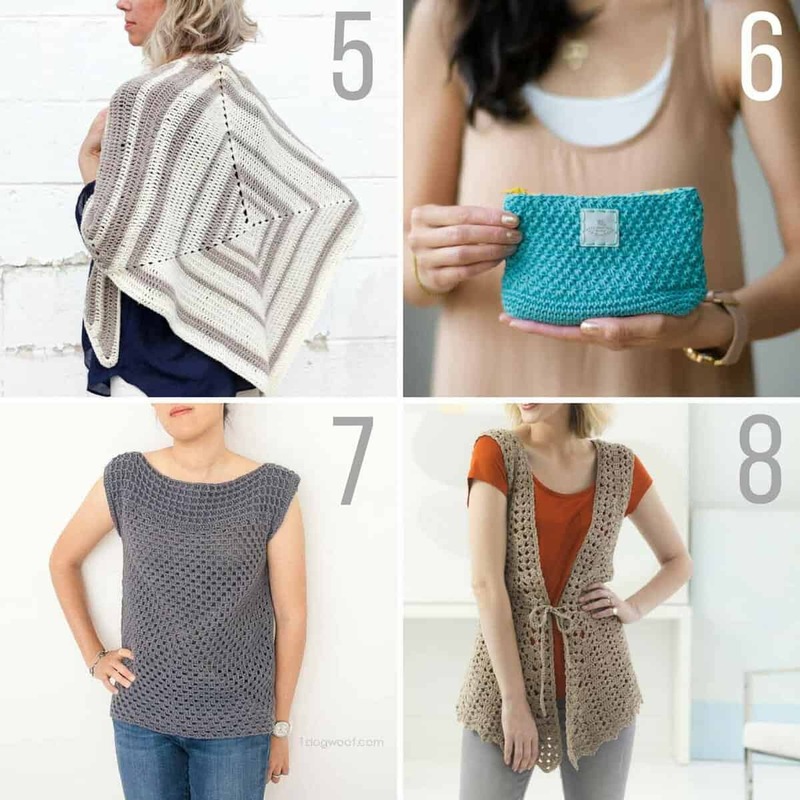 And while crocheting a cozy, chunky blanket poolside doesn’t sound very pleasant, there really are tons of fantastic spring and summer crochet patterns that are equally as cool as their cold-weather counterparts. 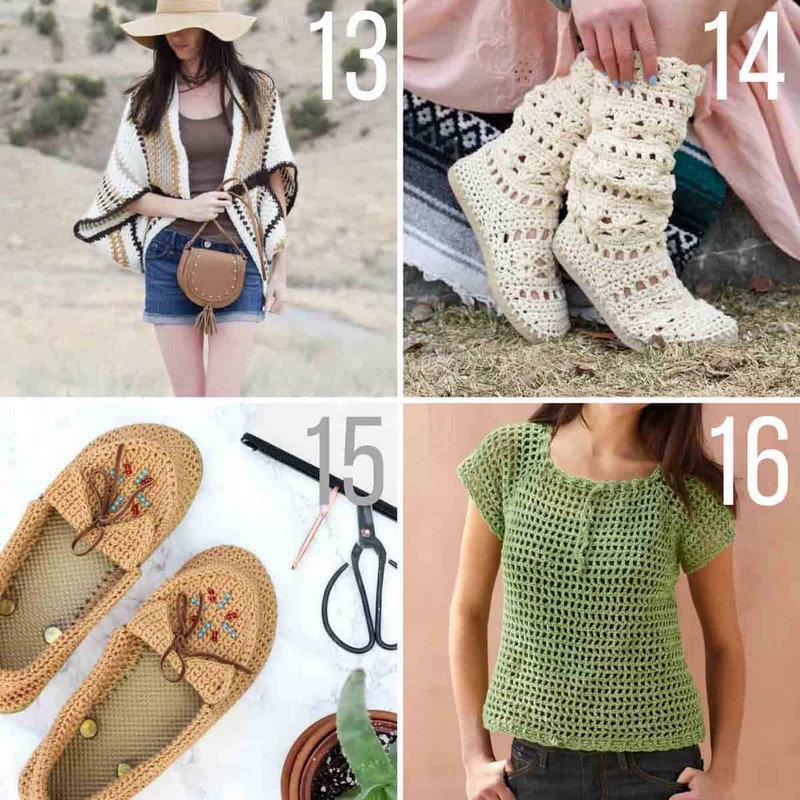 I asked some of my crochet blogging friends to share their most popular spring and summer crochet patterns and, guys, they have such fantastic designs! I can see many of these free patterns making perfect crochet Mother’s Day gifts, bridesmaid gifts or perhaps best of all, gifts to yourself! Treat yo’ self ladies, before the holiday season arrives and you feel guilty if you’re not crocheting for someone else! And one of the reasons I love designing for Lion Brand is because their yarn is so widely available. 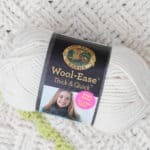 I know that whatever I use in a pattern, you’ll be able to easily get from LionBrand.com or a local craft store. So I’m happy to say that all of these spring and summer crochet patterns are made with Lion Brand yarn and for many of these projects, you can even purchase a kit that includes all the yarn needed to complete the pattern in one tidy little bundle directly from LionBrand.com. 1. 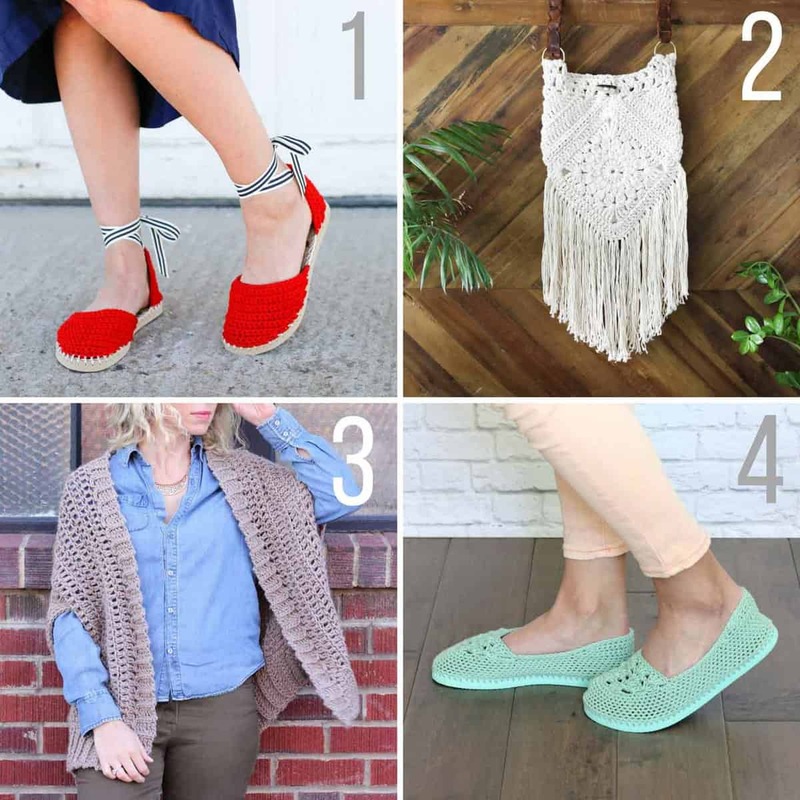 If you’ve never crocheted your own shoes before, this free crochet espadrilles pattern with flip flop soles is a great beginner project. Make some in every color for spring! Get the free crochet pattern here. 2. You’ll be the belle of the bohemian ball this summer with the “Urban Gypsy Boho Bag!” Pair it with a sundress for an effortlessly cool look. Get the free crochet pattern here and purchase a kit with all the yarn here. 3. Can you believe the “Cocoon Cardigan” is made from two simple rectangles? So much easier than it looks! Get the free crochet pattern here and purchase a kit with all the yarn here. 4. These lightweight summer slippers with flip flop soles are a Make & Do Crew reader favorite and you need only one skein of Lion Brand 24/7 Cotton to make them! 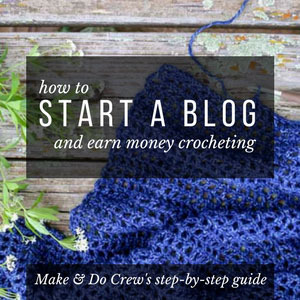 Get the free crochet pattern and video tutorial here. 5. The “Logan House Wrap” looks like a latte and feels like a soft hug. Wear it as a shawl in the summer and a scarf in the winter! Get the free crochet pattern here. 6. All About Ami’s “Star Stitch Pouches” are such a fun little crochet project for Mother’s Day or bridesmaid gifts! Get the free crochet pattern here. 7. 1 Dog Woof made this “Granny Squared Top” with two basic granny squares, yet it looks so sophisticated. Plus, this crochet summer top is super customizable to your body type! Get the free crochet pattern here. 9. This gorgeous “Boho Crochet Wrap” from All About Ami would make the perfect shawl to wear to a wedding or summer concert. I adore the modern look of this summer crochet pattern! Get the free crochet pattern here and a kit with all the yarn here. 10. Fight the good fight against over air-conditioned shops and restaurants with this “Canyon Shrug” from Lion Brand. You won’t believe how easy this stunning crochet summer shrug is to whip up! Get the free crochet pattern here. 11. 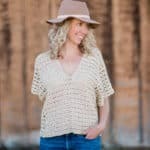 Mama in A Stitch’s “Topcho” pattern is made from two rectangular strips and makes a easy and flattering crochet top for summer. Get the free crochet pattern here and a kit with all the yarn here. 13. 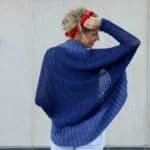 If you want to make one shrug that will work for all seasons, this “Baja Blanket Sweater” from Mama In a Stitch is a total winner. It’s made with New Basic 175 yarn, which is one of my favorites! Get the free crochet pattern here or a kit with all the yarn here. 14. My “Coachella Boots” with flip flop soles are lightweight, insanely comfortable and definitely level up a pair of cutoffs or a summer skirt. Get the free crochet pattern here or a kit with all the yarn here. 15. Similarly, these crochet moccasins are made with flip flop soles, making them both comfy and a super cool way to show off your crochet skills during the warmer months. Get the free crochet pattern and video tutorial here. 16. This “Mesh Raglan Pullover” crochet shirt pattern from Lion Brand will let the breeze in while still allowing you to get your yarn fix during the this summer. Get the free crochet pattern here. 17. Nothing says summer to me more than a picnic outside and Sewrella’s free “Gingham Picnic Blanket” just screams “eat something delicious on me!” Get the free crochet pattern here. 18. Whether you’re headed to the beach, on a hike or just to work, it’s always helpful to have a cute way to carry your gear. Enter Moogly’s “Knotted Rainbow Tote,” which feels fresh and cheery for summer adventures. Get the free crochet pattern here. 20. And when you get invited to that inevitable summer wedding, whip up this sweet little “Perfect Purse” in a color that matches your outfit. Get the free crochet pattern here. 21. Anyone fancy a movie? You can throw on the “Movie Night Cardigan” from Two of Wands anytime the AC gets to be a little too much. (Which, let’s be honest, is almost always in a movie theater.) Get the free crochet pattern here. 22. 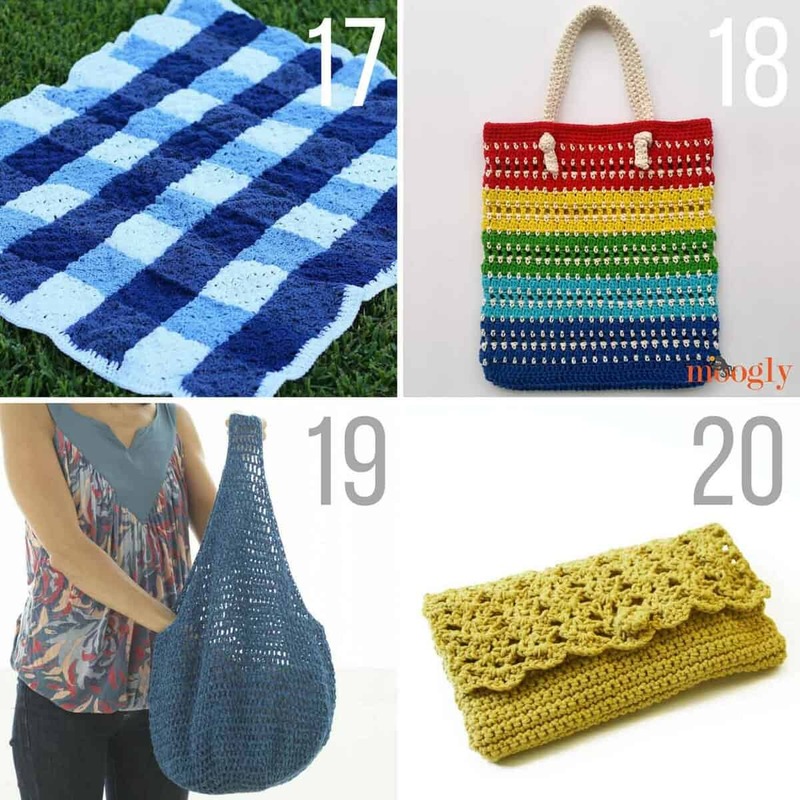 If you’re looking to crochet pool-side this summer, my “Finger Crochet Market Tote” won’t even require you to remember a hook! This super simple bag can be made very quickly with only your fingers. Get the free crochet pattern and video tutorial here or a kit with all the yarn here. 23. You’ll be the coolest crocheter at the BBQ this summer when you show up with this “Bring Your Own Bag” beverage holder from Moogly. Wouldn’t this make an awesome crocheted Father’s Day gift? Get the free crochet pattern here or a kit with all the yarn here. 24. 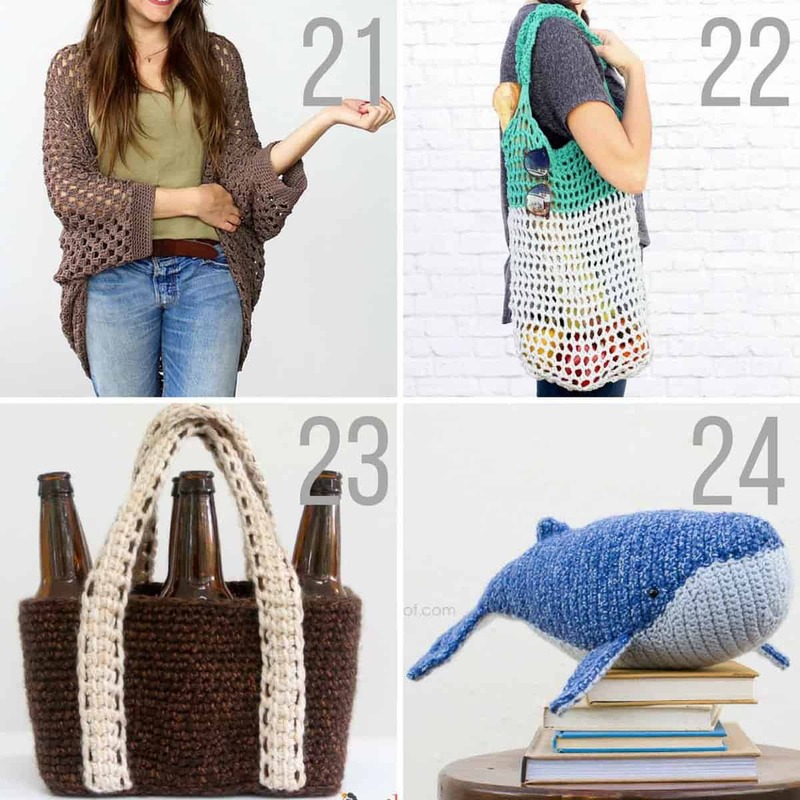 And what list of summer crochet patterns would be complete without a humpback whale? While this pattern from 1 Dog Woof is a little different than the rest, I just had to include it as an option for all the little beach-lovers in your life. Get the free crochet pattern here. Phew, what an awesome collection of spring and summer crochet patterns from some of my favorite crocheters on the internet. You might also enjoy my collection of 25+ Crochet Stitches That are Perfect for Afghans and blankets! Awesome round up! I always need inspiration for warm weather crochet! Thanks Chrisandra! I know what you mean. Once I started digging for these patterns, I realized there are plenty of things to keep me busy until it’s cold again! I teach crocheting to girls in grade 10 in India. Patterns are not readily available, and they wanted to make sweaters this year (their second year with me). I have devised a pattern using the sport weight yarn available here (I’ve also made it with American 4 ply) that works the sweater from side to side. I’ve got a square necked version and a turtleneck version. These are much easier to size w/o a pattern. Are you at all interested in seeing any of these? That sounds like a wonderful project for teaching the girls. They are so lucky to have you! My mom actually taught me to crochet in school as well and I loved having something to do with my hands. I’d love to see what you’re making! Feel free to email me at Jess (at) makeanddocrew (dot) com. Thanks for the free crochet patterns, I have started a project, but will definitely check these out closer later. I thank you very much for the free tutorials I love new projects, again thank you. I really had fun collecting these, Shirleyn. There are so many talented designers out there and I love being able to share their patterns with you! I can sure relate to that, Dorthy! Aren’t there so many beautiful things to make in the world!? I always start a project and then find myself with “project envy” about starting something new! My pleasure, Helen! Thanks for saying hello! I understand that for sure, I like to use books too. I don’t currently have a book of my slippers, but I do sell each pattern as a PDF that you can print out if you prefer not to work from your computer. Each PDF costs $2.50 and most of the slipper ones include a “ruler” to print for poking holes in your flip flops. Hope that is helpful to you! You can see them all here. Thank you for your generosity in sharing these wonderful patterns. We are going into Autumn here in South Africa so my fingers are itching to get going again after an extremely long, hot dry Summer. Oh yes! That is one of my favorite things about fall–it’s crochet season! I visited South Africa a few years ago and found the landscape stunning. Thanks so much for saying hello, Sue! I was looking for something to make for the 4th of July, something small to give out as pins…Uncle Sam hat, or a small US flag…do you have anything like that? That sounds like such a fun idea! These coasters aren’t a pattern, but you might be able to take some inspiration from them to come up with your own flag design. Also, maybe a smaller version of these potholders might work?